The book's story begins when Gary, a young boy, finds himself at home with his babysitter one boring afternoon. 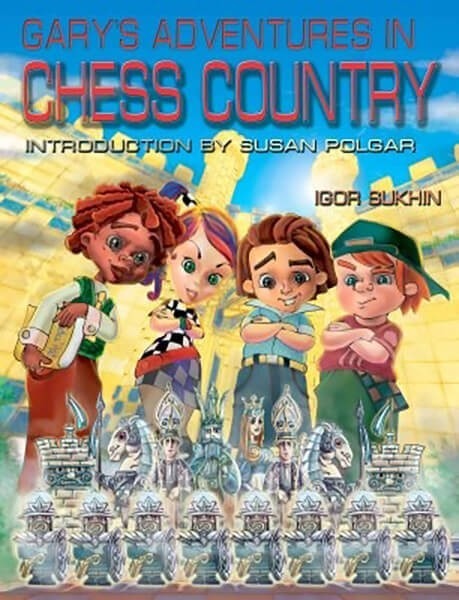 His day picks up when a young girl named Cassie comes to take him away to Chess Country, a world where everything is related to the royal game. Along the way, Gary meets many of the residents of Chess Country, including Riddles -- who provides Gary and the reader with numerous chess puzzles -- and Zug, another young boy who will become Gary's chess rival. The story is fun and should encourage young children to read on to find out what happens. Large, cartoonish graphics are also tailor-made for kids and should keep their attention, at least for a while. While there are plenty of books out there for children beginning to learn chess, this is perhaps the one that is best designed to capture the attention of a young mind. They might not realize they're learning while they read, but all the information needed to play the game is there. First, Gary learns about the chess board; then he goes to various locations to "meet" different pieces and learn about their moves. Finally, the rules of check, checkmate and stalemate are introduced, and only then does Gary venture to play a full game of chess. Of course, you might not be quite so lucky with the child who reads this book; children often want to play as soon as possible, and the book might be too long for them to wait out before they ask for the complete rules and demand to play a real game. Even if this happens, though, it's okay; the real strength of this book is that children are likely to continue to come back to it, learning new things and reinforcing the concepts they've already read about by rereading chapters and solving the puzzles again and again. As they play and read, they'll start to grasp the rules and tactics presented in the book much more quickly than they would if they were "forced" into learning them. Older children might find this book a little too "childish" for them, and might prefer one of the many other books for beginners that present the game in a more straightforward manner. But Gary's Adventures in Chess Country isn't for the older set; it's specifically designed for young children who will get wrapped up in the story and graphics and learn chess without realizing they're learning anything at all. If you're looking for a way to encourage a budding grandmaster under the age of 10, Sukhin's Chess Country is the perfect way to teach them the game.